Martin Schmidt’s Mainz side continued their tradition of producing excellent results against the Bavarian giants and left the Allianz with a 2-1 win in this mid-week clash. They came into the game on brilliant form with Schmidt leading his side to now 5th place with a system centred around the excellence of Yunus Malli. Under Schmidt, a 4-4-2 formation has become something of a staple in Mainz’ game and has been used on a consistent basis. However for this match at the Allianz we saw a change from the Mainz dugout as they lined up in an asymmetrical 5-2-3 shape which structurally was quite a departure from their usual showing. Despite the differences in formation, many of the strategical features of the usual system remained with some clear man-orientations in defence and an attack focused around Malli in the centre. Mainz’ pressing with the asymmetrical defensive line. The asymmetry of this 5-2-3 came from the defensive line, as Donati’s positioning was generally higher up than the left-sided Bussmann. Whilst the left-back took on a fairly orthodox orientation, Donati acted higher and has an interesting role during the Mainz pressing where he would move much higher either forward or diagonally. In these situations it would either be to support defensive access and to apply pressure on Bernat or alternatively, support the spatial compactness in more central areas and around the right half-space. The latter was the case commonly when the front three pressed higher and acted as a means to close out space between the lines whilst the defensive line shifted across. Furthermore, from the right half-space Donati could support their defensive access by taking a position where he could press either Thiago or Bernat. As a result of this feature, Mainz situationally showed as a 4-3-3 through Donati’s support of the double 6 pairing. During the Bayern’s build-up stage, the front three of Mainz all took on high positions as Malli played centrally in between Samperio on the left and Clemens on the right. From this shape they looked to prevent Bayern through building their possession through the centre of the pitch by the forwards blocking any passing lanes towards the middle whilst simultaneously inviting the ball into wider areas. Upon achieveing their goal of forcing Bayern out wide, the ball-near forward immediately drops towards the midfield and diagonally presses the ball along with the support of the ball-near full-back too. The other two forwards shift across slightly and provide a degree of coverage on any Bayern passes back towards the defensive line. Baumgartlinger would move higher to follow Thiago in the Mainz press. In an attempt to further restrict Bayern’s ability to move the ball through the centre we saw some interesting movements from Baumgartlinger. 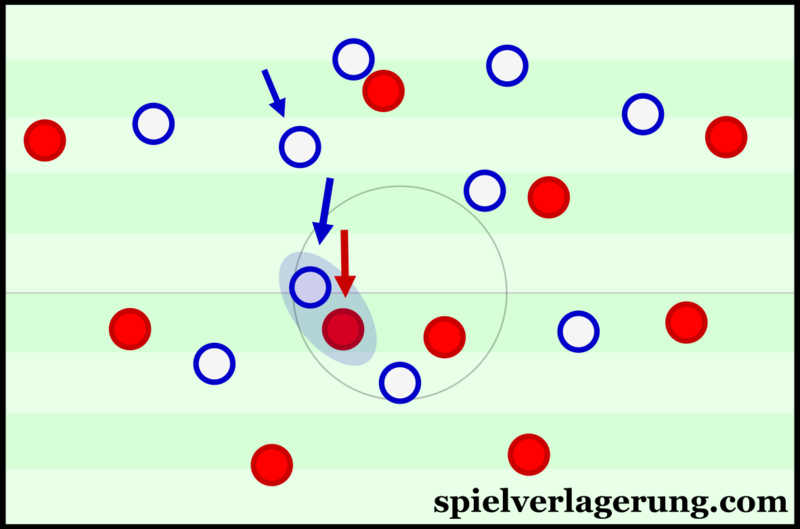 In alignment with the typical Mainz man-orientations which remained despite the formation change, the midfielder situationally took on a higher position during their pressing. Mainly as he looked to maintain individual access on Thiago when the Spaniard moved closer to his deeper teammates, Baumgartlinger at times was positioned roughly on the same line as Malli. This aspect could potentially have left open spaces within the Mainz midfield without the presence of Baumgartlinger however the space was quickly filled by Balogun moving up from the defensive line. Troubled to overcome Mainz’ strong defensive game, Bayern showed some issues in possession as Guardiola decided on a typically-flexible shape which lacked a real formation. Both full-backs made frequent inside movements and were considerably higher than the centre-back pairing, Vidal again took on the 6 position and made some dropping movements but would otherwise position himself on the 2nd line of players. Thiago made a number of movements through the left half-space and could also drop into deeper positions whilst Robben, acting as the right-sided 8 had a much more different orientation and would play higher near Coman and Lewandowski. 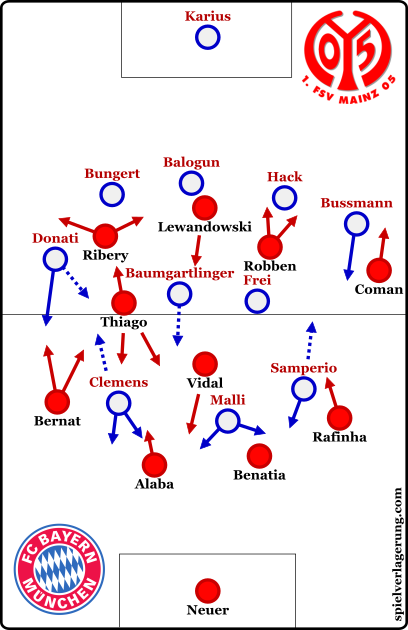 The two flanks were occupied by Ribéry on the left and Coman right, who both found the ball in many isolation situations through the game whilst the team was lead by Lewandowski who regularly dropped towards the midfield. The inside-orientation of the full-backs was similar to how Bayern have shown in recent weeks, as Bernat on the left took on a more advanced positioning than his Brazilian counterpart on the right. Rafinha however was not as effective as Lahm in the right half-space, which had some negative implications for their possession through the right side of the pitch with a worse level of connections and general ball circulation. Bayern’s inside full-backs supported their ability to create isolations in wide areas. However these situations didn’t amount to many chances. Within the Mainz third, Bayern struggled to penetrate the centre of the pitch which Schmidt’s side controlled well for the majority of the game. Instead, they often looked more towards creating isolations in the wide areas and the integration of the two wingers in many dribbling situations. With both full-backs inside, they were able to achieve this quite often as Rafinha and Bernat usually occupied the attention of the Samperio and Clemens to leave the full-backs isolated. However they were rarely effective in these situations and few of the dribbling attempts resulted in chances. Both Mainz full-backs defended well and were supported by the 5-man defensive line, which gave them better compactness across the defensive line and thus they closed the spaces around the wingers better. Without the space, the winger’s attempts at dribbling were also weak, whilst Bayern’s passing towards them was sub-optimal as it gave time for Mainz to shift towards the ball sufficiently. Shortly after the break, Guardiola made changes to his team and replaced Coman with Thomas Müller. The German forward moved into the right 8 position and Robben shifted over towards the right. This shift brought about a slight change to the dynamics of the attack as Müller’s movement looked to open up space in the right half-space, where Robben looked to attack more frequently than Coman. Additionally to this change, Thiago increasingly made more movements towards the six space and often appeared to be playing in a double pivot with Vidal. Through this he likely aimed to generate more presence in the centre to possibly allow Bayern better access in building through the middle of the pitch. With the deeper orientation of Thiago, it must also be noted that Müller started making movements towards the left half-space where could potentially exploit the space left considering Baumgartlinger’s man-oriented movements of the first half. The Bayern coach made more changes as the game developed and replaced Thiago with Douglas Costa later in the second half. Now it became Costa and Ribéry occupying the two flanks with the support of Robben and Müller in the two 8 positions. In the respect of Mainz, Schmidt’s side played the majority of the second half as more of a 5-4-1 without the ball. Primarily through the Bavarian dominance of possession the away side played in a lower defensive block looking to formerly protect their lead and then, after Robben’s equaliser, defend the draw. Progressively showing more fatigue as the second half wore on, Mainz’ defence lost a degree of stability against the home side’s dominance yet they managed to contain what an improved Bavarian attack. Their ability with the ball also diminished without the genius of Malli to orchestrate their counter-attacks and ultimately Cordoba’s late winner came significantly against the rhythm of the game. Mainz’ win was certainly something the Bundesliga needed as after this coming weekend Dortmund could be placed just two points behind the Bavarian leaders. Schmidt’s side yet again proved their worth with a very strong performance which contained Bayern to just 0.9 expected goals (from @MC_of_A) at the Allianz. His choice to turn to a 5-2-3 proved an excellent one and the extent at which they minimised the threat of Bayern’s attack has not been matched by many in recent years. For the second game running Bayern have been unable to create to their usual standards and despite their improvements in the final 30 minutes of the game, were unable to overcome a strong Mainz defence.